The last post I put up was about the different communications technologies used by humanitarian aid workers, which form part of the responsibilities of a humanitarian logistician. Of course, each one of those bits of equipment requires energy – most have batteries that need to be charged and others need to be connected to a mains power source (e.g. a wall outlet) or equivalent (e.g. 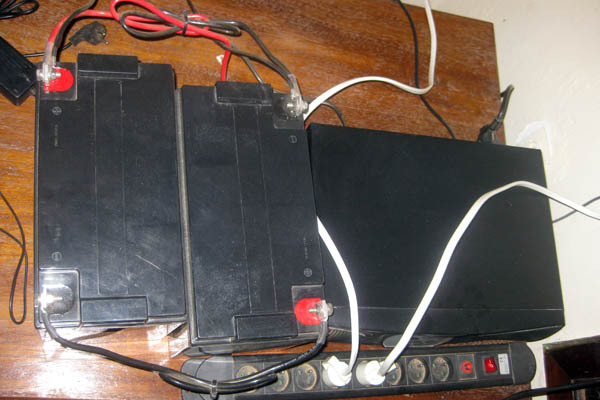 an inverter that converts DC electricity stored in large batteries into AC electricity like the stuff that comes out of a wall outlet) to be operational. In the countries in which humanitarian and development organisations work, however, a source of electricity is often hard to come by or non-existent. In the initial days of an emergency response, such as the surgical teams that Merlin (Medical Emergency Relief International) sent to Haïti after the earthquake in January, there’s usually no source of power at all. 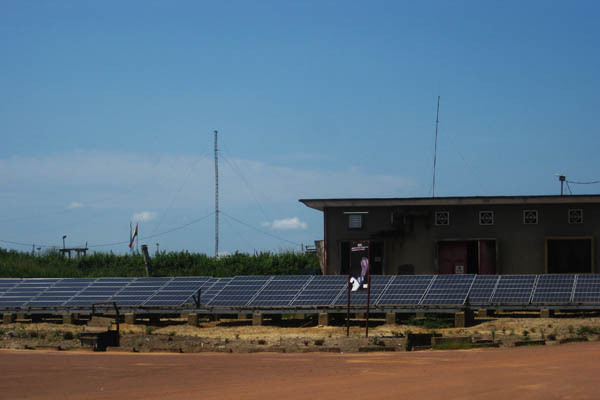 Solar power is useful in many countries, because of the amount of sunlight they receive. However, solar panels are still very expensive and they don’t produce a large amount of electricity. 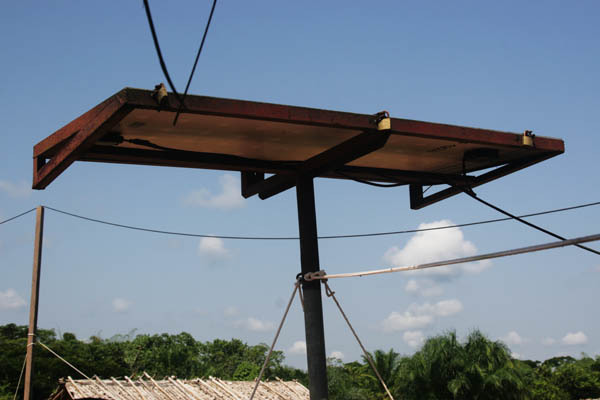 Still, they have certain useful applications, such as the panel below which is mounted in Mukwanyama village in Maniema Province of DRC. It’s hooked up to the CODAN HF radio kit on loan from MSF Belgium, which the village clinic uses to make emergency calls for the MSF hospital ambulance from Lubutu (there’s a photo of the radio in the last post). This panel charges a couple of 12V batteries, just enough energy to use the radio for short amounts of time when needed. 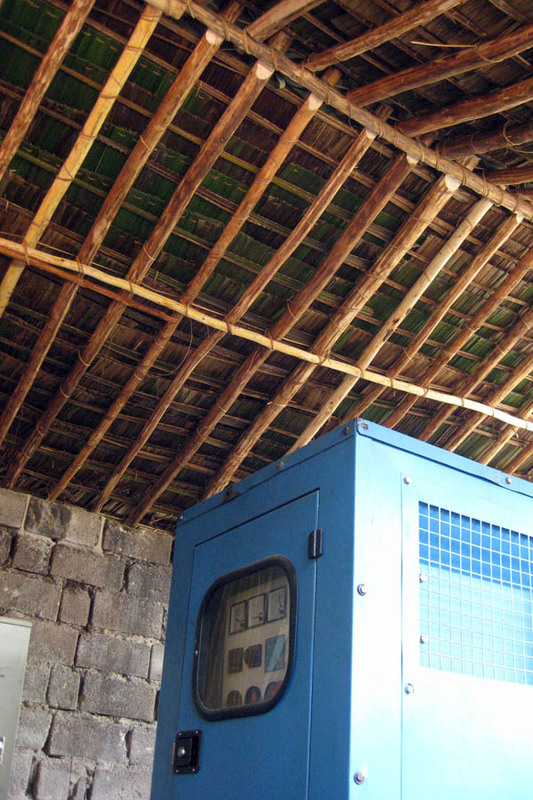 A more commonly used means of producing electricity is the generator. A generator is basically a motor that’s used in the opposite way. For example, take the little motor out of a toy car and connect it to a little battery with a couple of wires and the motor turns because electricity is going into the motor. Now, replace the battery with a tiny lightbulb and spin the motor with your hand – the lightbulb will light up. A generator is a larger, more complex example of the same thing (hydroelectricity water turbines are, too). Fuel (usually diesel) makes the motor turn, which produces electricity. This is a wee little 3 or 4 kVA portable generator that we sent to Haïti. I think it lasted a couple days before burning out because they plugged in too much stuff for such a small generator and ran it for long periods without cooling – big no-no’s in correct generator use. 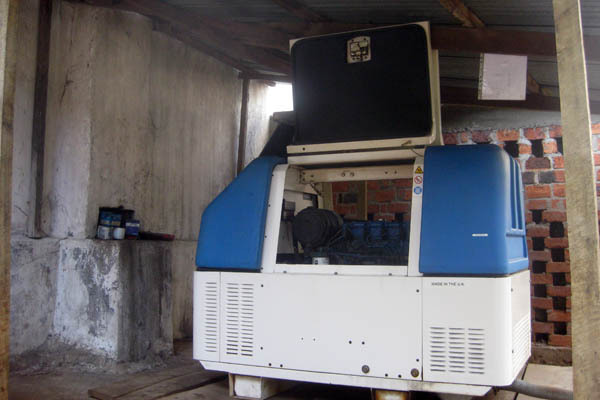 This is a much more powerful 22 kVA Perkins generator used to power the Merlin Kindu base – several dozen computers, fans, lights, radios, etc. 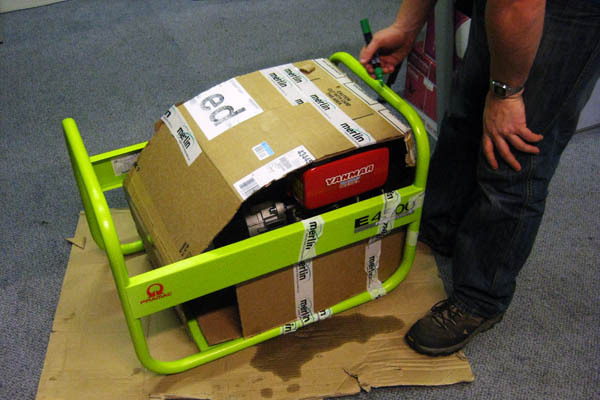 The disadvantage of a good generator like this one is that it’s not portable – this thing is bloody heavy! Also, it consumes much more fuel which costs more money, so there’s no point in using a 22 kVA genset if you only need 5 kVA (there are other reasons for this, but it starts getting a bit technical). For various reasons, generators can produce uneven current which can damage the stuff that’s plugged in, especially sensitive electronics such as computers and radio equipment. 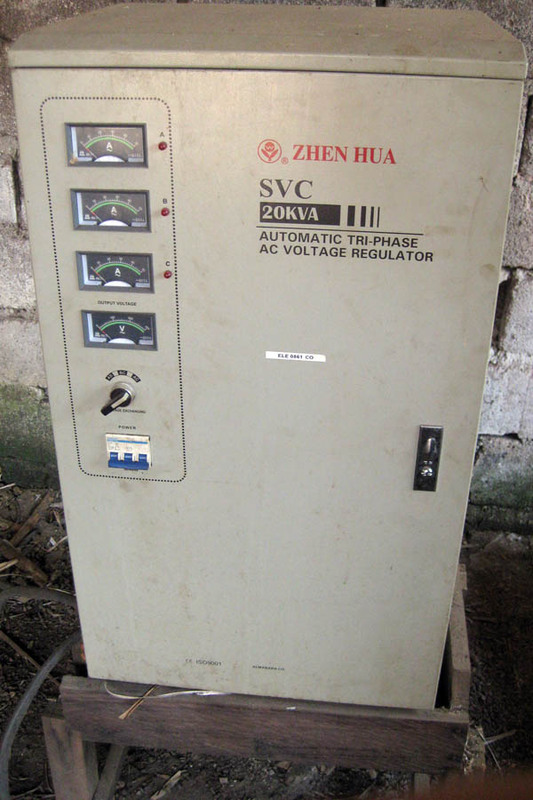 In order to protect these machines, surge protectors and voltage regulators are used. In this case, the Lubutu base has a massive voltage stabiliser connected directly to the generator so that all power going to the wall outlets has already been stabilised. I still keep a surge protector connected to my laptop because it never hurts to have extra protection. When you use a generator to power stuff, you need to start up the genset first and let it run a tiny bit before the electricity starts running into your equipment; otherwise the initial startup (like when starting your car) produces a spike in current which could damage your stuff. So generators have switches on them to start allowing the power through the connected wires, and often there’s a big switch to choose between different power sources such as city power and generator power, or between two different generators. 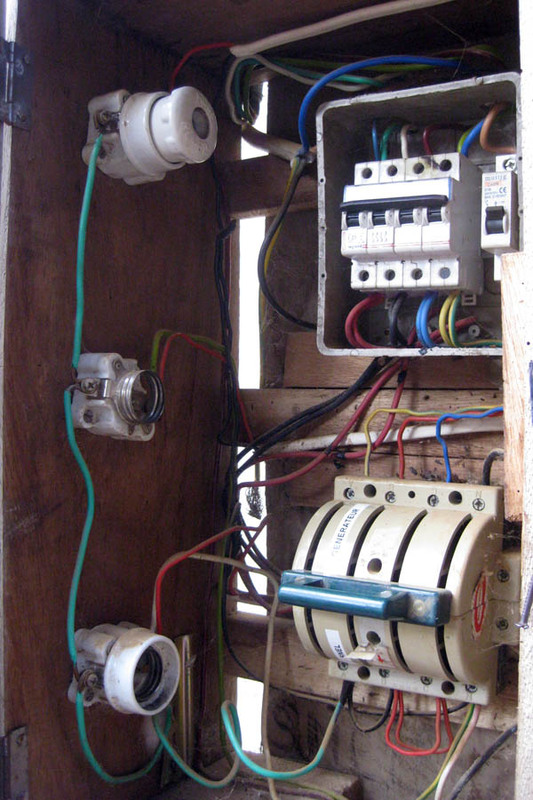 This one in Kindu could use some tough love, as the wiring is a little sketchy, but it works. The middle position is off. I labelled the top as “générateur” and the bottom “SNEL” (Société Nationale de l’Electricité – local city power) because the guards who use it sometimes got confused which side was which. Maintaining the generators, battery banks with their inverters, and the occasional solar panel, can take up a fair bit of a logistician’s time if he/she doesn’t have someone specifically assigned to those tasks. Often the head mechanic is in charge of generator maintenance because the main component of a generator is the motor. Generators also have filters that need to be changed, fuel and coolant reservoirs that need to be filled, and other things in common with vehicles. Once a humanitarian worker has access to a power source, he/she can hook up the fridge and put some water bottles in the freezer for those days when the sun is blazing and a bottle of cold water is manna from heaven. But where to find that water? This entry was posted in Africa, Democratic Republic of Congo, Humanitarian and tagged Energy, Generators, Haiti earthquake, Kindu, Logistics, Lubutu, Merlin, Solar power.